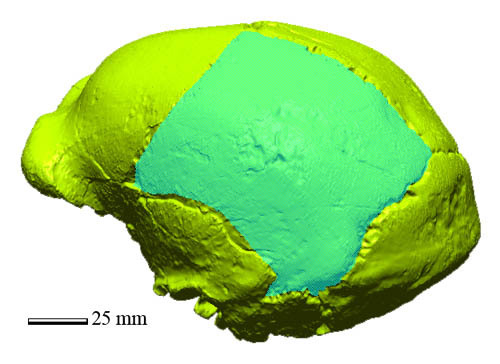 Paleoanthropologists from the Institute of Vertebrate Paleontology and Paleoanthropology (IVPP), Chinese Academy of Sciences, used both traditional metrics and recently developed 3D scanning techniques to explore the morphological variations of Peking Man’s skulls at Zhoukoudian Locality 1, and found that the skull of the latest inhabitant did increase in every direction as compared to the earliest inhabitant, but the shape remained relatively stable. The slow evolutionary rates derived from11 cranial measurements indicate Peking Man is an isolated population. Researchers reported in the latest issue of Acta Anthropologica Sinica 2012 (3). Peking Man is a collective name given to a group of hominid fossils found at Zhoukoudian in the suburbs of Beijing. Six skulls from Peking Man were discovered at Zhoukoudian Locality 1 since the official excavation in 1927. In 1941, Pere Teilhard de Chardin emphasized the morphological stability of Homo erectus from Zhoukoudian throughout the 50 meters of sediments of Locality 1. He believed that not a single anatomical difference could be detected between the skull remains found at the very bottom of the deposit and those collected at the very top. This morphological stability was evidence of a slowness that characterized biological evolution whenever not obscured, disturbed or accelerated by the intrusive immigration of foreign elements. This morphological stability was challenged when skull ZKD 5 was described which was estimated about 300000 years younger than the skull ZKD 3 from the bottom deposits. The morphological variations of skulls between the probable first and last inhabitants, represented by ZKD 3 and ZKD 5, were scaled by those between NJ 1 and NJ 2 skulls from Nanjing, whose owners probably spent the same duration as ZKD 3 and 5. After comparison, researchers found that the skull of the latest (or top) inhabitant at Zhoukoudian Locality 1 increased in every direction as compared to the earliest (or bottom) inhabitant, while the shape somehow remained relatively stable after hundreds of thousand years of evolution. “We used 11 cranial measurements to determine evolutionary rates of Homo erectus from Zhoukoudian and Nanjing. The results show that biological evolutionary rate is very slow, compared with that of hominid from Nanjing. The Homo erectus crania from Zhoukoudian may represent an isolated population, and as a result, lacked evidence of gene flow from outside populations”, said first author XING Song of the IVPP. This work was supported by CAS Strategic Priority Research Program, National Natural Science Foundation of China, and Basic Research Projects of MST of China.